With all the other things you have to do before the big day, don’t forget about bridal beauty! You want to look as good as you possibly can on your big day. After all, you will be the focus of many pictures! Check this bridal beauty timeline and save our infographic! Start a relaxation regimen. Take one night a week to do anything, but talk about the wedding. This could be a night out or a night in, whichever is more relaxing for you. This is a small way to ensure your bridal beauty. If you want to try a new hairstyle or color, this is the time for it. Talk with your stylist and start experimenting. Also, start taking care of your skin, if you don’t already. Stress can cause all kinds of skin problems and you want to look and feel your best. Don’t forget your eating and drinking. Too much caffeine mixed with wedding stress can bring breakouts on your skin. Exercising is another way to make sure you are ready for your big day. It will help you work out some of your stress while strengthening and toning your body. Take a session or two with a trainer to jump start your routine. There are many things out there that will help you relieve your tension, but few will do it while building strength and toning your body. Yoga is known for its stress relieving, as well. This may be a great way to ensure your bridal beauty. If you’re serious about losing weight before your wedding, talk to your doctor and make a plan for nutrition as well as fitness. Set a logical weight-loss goal and meet it before the dress fittings. You’ll want to maintain your weight once the dress fittings begin. You may want to reconsider losing weight, as your guy thinks you look great just the way you are! Though you still have a lot of time until the big day, but you might feel yourself a bit stressed already. Treat yourself with a spa themed bridal box for taking off stress from planning. Try Keep Calm & Plan On to make the most of your engagement and preparations! Each bridal box is a surprise, so you never know what’s inside, but past boxes included such awesome items as a Floral Kimono Robe or bath bombs. After all, as stressful as wedding planning is, it is a most amazing time in your life – enjoy it to the full! You don’t get married every day, and Bridal boxes with their mysterious content surely bring in some fun in this challenging time. It’s so nice to let in some kind of pleasant surprise into your life – probably one of the reasons bridal subscription boxes are becoming more and more popular. 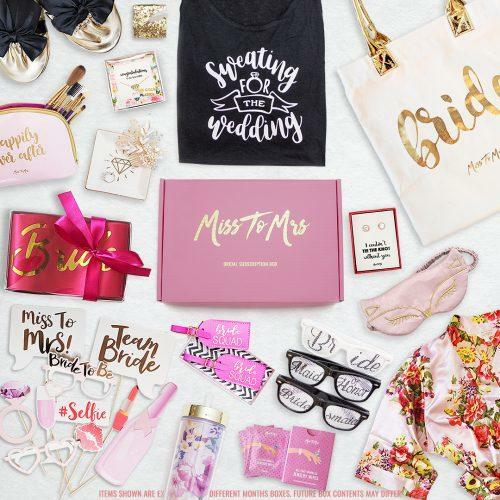 Miss To Mrs Bridal Subscription Boxes have a new theme every month, which adds a lot of fun to the preparation process and reliefs the stress every bride experiences. They are a great option for an engagement present, so if you are going to make an engagement registry you know what to put on the list! Make appointments with the hairdressers your considering if you don’t plan on using your own. Make sure you bring along pictures of your veil and headpiece, as well as hairstyles you like. If your bridal beauty includes an updo, talk with your stylist about how long it will take to get your hair to the right length for the style. Once you choose your stylist, be sure to book them and come up with a schedule for the wedding day. Makeup is one area you don’t want to mess up! Make sure you either hire a professional or arrange for the best person for your make up. The reason you’re doing this now is to give you time to practice before you need your bridal beauty. When you have made your choice, book them for your wedding date. Make sure the two of you prepare a day-of-wedding schedule. If you are going to do a self-tan, make sure you think about your gowns neckline and those tan lines you have to cover up. Meet with the person doing your make up and do a trial run. This will give you a preview of your make up to make any needed changes before the big day. After all, bridal beauty doesn’t just happen. If you’ve chosen to do your own makeup, get a makeover at a department store, then buy what you need. Make sure you practice applying it several times before the wedding to get the look you want down pat. A practice run of your hairstyle is a good idea, as well. This will give you time to fix what you don’t like before the big day. Getting your eyebrows professionally shaped will help bring out the princess on your wedding day. This is a great time to try it! Take a girl day and get a facial done at a salon or do one at home, either way, you don’t want to wait to find out you’re allergic to it! Do not experiment with your hair anymore. Get your haircut or trim for the last time. Don’t forget to touch up your color. Eat veggies and fruit for energy and remove the salt and fat from your wedding diet plan. Drink plenty of water for clear glowing skin. Exfoliate your skin, making sure to get those rough areas on your elbows! Continue exercising for your mental well being as well as physical. The big day appointments need to be confirmed and remind your man to get his final trim if he has yet to do so. Oh, those fabulous wedding parties! So much fun, so easy to overindulge in alcohol and snacks. Keep a tight lid on those, especially now. Get yourself waxed and shaped for your wedding night and don’t forget to shave those legs! That wedding lingerie doesn’t hide enough to let you get away with anything! Give each other a massage, you both need it. Or, if you can afford it, splurge on a professional massage for the both of you. Don’t wait until the day before the wedding to do your final facial. After all, it takes a bit of time for your face to get back to normal. Drink as much water as you can stand. Is your skin clear? Pack a kit of beauty items you will need with you on your honeymoon and, possibly, as an emergency before your wedding! Your hair will need deep conditioning to prepare it for the fancy style. Your skin will need to be exfoliated, again, so it gleams on your wedding day. Get a professional pedicure and manicure, everyone will want to see that ring! With all this done, you have only one thing to do for preparation. Take a long, relaxing bath. This is not a day to skip out on eating, make sure you eat something before the wedding. Get your hair and makeup done. Wear something that you don’t have to pull off over your head. Take a few moments for yourself. Think about what this day means to you and your man. Now, hurry! They’re all waiting for you! Over the years, hundreds of wedding makeup specialist have shared their thoughts and insight on the best bridal beauty tips. Brides want to look radiant and these ideas will help them to enhance their natural beauty while accommodating that romantic glow that beams from inside. Follow these wedding makeup tips and watch the eyes of your guests follow every gleam of your beauty. Protect that beautiful smile by avoiding foods and drinks that add a shade to your smile. That’s right, protect the glow of those pearly whites by not eating or drinking any dark-colored foods and beverages. Berries, dark chocolate, sodas, and wine are examples of what should be avoided. Also, consider a professional or at-home whitening system to enhance those pearly white teeth. Any plans on waxing the bikini line should be done with a 3-month trial and era process. Doing so helps to avoid any unforeseen complications and helps to prepare the skin for the changes brought on by waxing. The pain lessens each time and no one wants swelling and redness on their wedding night. Always have these type of services done at least one week prior to the wedding. It’s also a good idea to have trial runs to determine the best look for the wedding day. These runs can be done at least one to three months prior. It is okay to change these things but do it at least two months before the wedding. It allows your skin an opportunity to respond to the changes. Rashes and hormonal changes would be unwelcome guests during the wedding. Although you want to look ravishing every day prior to your wedding, avoid flat ironing your hair before style trials or the wedding day. Doing so could cause a major disconnect in the style that you will be attempting or be wearing. Many styles require fresh, soft and smooth flowing hair and flat irons can manipulate these textures. Maintenance is everything and things like a touch-up case or bag will come in handy. These can be used during the reception to touch-up the polished look after dancing and mingling with the guests. Make-up wears off and perspiration is likely so don’t be afraid to touch it up. Your MUA and hair stylists will love to see your wedding day look. This presents a great opportunity for them to develop or build their portfolio with your amazing look. It also debuts you like the beautiful bride for potential clients of the stylists to gasp in awe as they choose to duplicate your look.